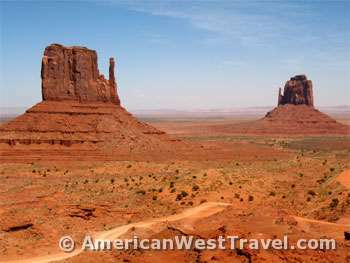 Monument Valley Navajo Tribal Park offers some of the Southwest’s most famous and unusual scenery. Its Navajo name, Tsé Bii’ Ndzisgaii, means “Valley of the Rocks”. The high desert landscape on the border of Arizona and Utah is a fantastic wonderland of colorful mesas, spires, buttes, and monoliths. 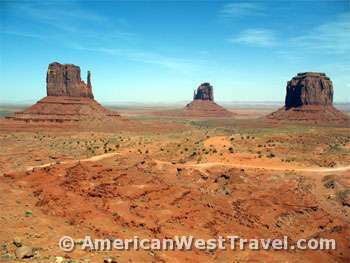 Monument Valley is well-known for the many movies filmed in the area, including the 1939 classic John Ford western, Stagecoach, which made John Wayne a star. The Navajo Nation owns and runs the tribal park with the center of activity being the View Hotel complex which opened in 2008. It features a visitor center, hotel, restaurant, trading post, observation decks, and offers guided activities. The View Hotel features rooms looking directly out across the valley. There is also an inexpensive but very primitive campground near the visitor center in an open unsheltered area. A park admission fee is charged per person upon entering the park. You may take a self-guided auto tour of the valley on a 17-mile dirt road which accesses many of Monument Valley’s landmarks, most notably East and West Mitten Buttes, Three Sisters, John Ford’s Point, Totem Pole, North Window, and Artist Point. The somewhat bumpy road is suitable for most vehicles with the initial descent from the visitor center being the roughest. High clearance vehicles are recommended but are not required. There is only one self-guided hiking trail open to the public: The Wildcat Trail, 3.2 miles in length, which circles around West Mitten Butte. Expect to take about two hours. Be prepared for very hot desert conditions in the summer. The trailhead is reached by a spur off the scenic drive. The most famous formations in Monument Valley, the Mittens stand nearly 1,000 feet above the valley floor and are about 1 1/4 miles apart. Most photographed feature in Monument Valley. The sandstone butte resembles a huge elephant where the head and trunk appears at the leading edge. The three columns at the end of Mitchell Mesa resemble “three sisters” where the two big sisters are guarding the smaller middle sister. This point is named in honor of legendary Hollywood director John Ford, who directed the 1939 classic Stagecoach plus nine other Westerns among the buttes of Monument Valley. It was used by Ford in a scene for the 1956 movie, The Searchers. This sandstone butte takes on the shape of a camel. Symbolizes the hub of a wagon wheel. Totem Pole, a tall (over 400 feet) but slender spire was last climbed by Clint Eastwood and George Kennedy in Eastwood’s 1975 film, The Eiger Sanction. The Yei-Bi-Chei pinnacles are named for their resemblance to the real dancers who appear on the ninth and last night of the Navajo winter religious ceremony called “the Night Way”. Famous photographed location for sheep herding scenes on sand dunes that have symbolized Monument Valley. Provides the best supply of water in the valley. A vast panorama with views of Sentinel Mesa, Mittens, Merrick Butte, along with more distant buttes and pinnacles. A magnificently framed vista point of East Mitten Butte and the valley to the north. This vista point is located between Elephant and Cly Buttes where Cly in Navajo means “Left”. Due to the angle of view, the spire (“thumb”) of the East Mitten does not show. A rounded, protruding spire which sits apart from the end of Camel Butte. Said to resemble a cowboy boot. Not far from the North Window viewpoint and it is the last stop on the drive. Guided tours are offered to those who wish to delve deeper into the park and see some of its best attractions, such as Mystery Valley and Hunts Mesa. 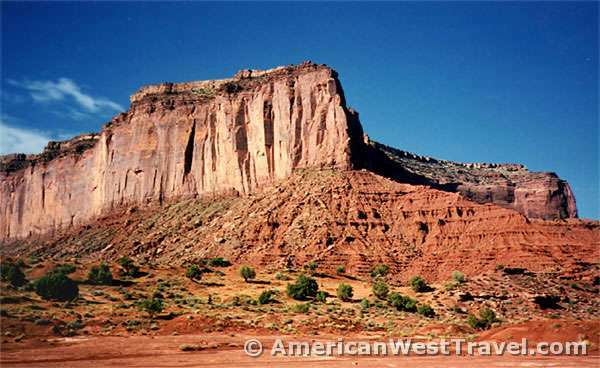 Tours are offered by numerous vendors for horseback, open-air vehicle, jeep, or hiking and showcase more exquisite formations, ancient Anasazi ruins, and aspects of Navajo culture. All of the tour guides are local Navajos with first-hand knowledge of the area. Many of the services are local and Navajo-owned. View a list of authorized guides from Navajo Nation Parks & Recreation. Goulding’s Trading Post and Lodge is adjacent to the park entrance (west side of US-163) and has for years offered camping (with amenities and is sheltered), lodging, a restaurant, and other traveler services. Goulding’s conducts a variety of guided tours in open-air vehicles. They use local Navajos exclusively as guides. For more info about activities, spectacular scenery, and other points of interests in the general area, please check out our Canyonlands & Four Corners Travel Guide. It covers the diverse Southwest region where the states of Arizona, New Mexico, Colorado, and Utah meet. It features Arches and Canyonlands National Parks, the rugged San Juan Mountains of southwest Colorado, and the cliff dwellings and other artifacts of the Ancestral Pueblo (Anasazi) people at world-famous Mesa Verde National Park and other sites. For more information on the Monument Valley Tribal Park, please visit the official Navajo Nation Parks & Recreation website. 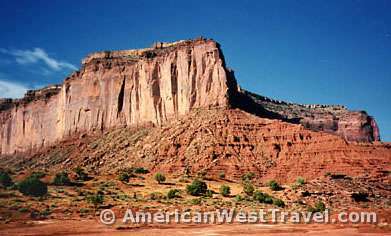 The park is located on the east side of US-163 in Utah just north of the Arizona border. Additional traveler services (gas, food, and lodging) may be found in Kayenta, Arizona about 22 miles to the south.